Love Rugers, Love Stainless Steel! It was the best price available...and my wife made me. Also, Ruger GP100 has great reviews, everyone saying how reliable it is. I plan on using this as my camping gun. My research indicates this is the best bang for the buck revolver. Built like a tank and can handle those hot and heavy loads. Best price for this items. $30 to $150 cheaper than anywhere else got to love it. I was so excide when I found the GP100 for this price. They also have great shipping rate on fire arms. This was a good deal all around for me. I like shooting a .357 & this is a well-made, well thought out revolver. I SAW A VIDEO ON YOUTUBE AND LIKED THE REVOLVER. Looks like a good rugged gun. Ruger has a good reputation. Quality, reputation, reviews. Just Looks Cool! A solid revolver for the price. Best reputation and toughest .357 on the market today. Good quality,medium sized 357, 7 shots a bonus. I have a Henry .357 and wanted a revolver to go with it. This one has best reviews at by far the best price. I read an article in "American Rifleman" that was very complimentary of this pistol. Further research reinforced this so I decided to get one. It will be useful in the woods for protection against dangerous animals. Chose to buy through grab a gun after checking there prices to others. Good reputation that made me finalize my transaction with them. Great firearm. The .357 is my favorite revolver in regards to versatility and accuracy. I saw the 7 round capacity, and I had to own it. The design makes it the most rugged on the market. Looks great. Had the six round long time ago. Sold it, regretted it, along comes 7 shot and had to get it. If you don't have one, you don't know what you're missing. Have been looking for this model in 7 round and found it here at a great price! Can’t wait to receive it. Wanted a gun that was handy for my wife, but heavy enough to soak up some recoil. Checked out videos of this gun...sold me. I love the 357 caliber revolvers.. Built stronger than the Smith and Wesson and without an internal lock. 7 rounds made the tipping point for me. It was the best price anywhere with no hidden costs. Good balance of power and portability for woods carry (cougar & CA black bear). The reviews were stellar and it seems buyers have been very happy with the GP100. My first interest was geared towards a S&W 686. However, the reviews had me concerned about the customer service as well as the canting issue with the barrel. 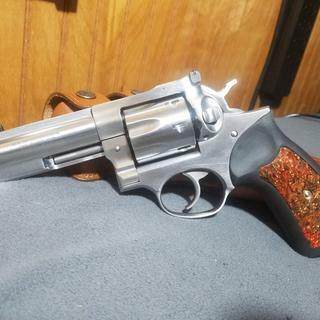 I've long contemplated getting a revolver and just decided after looking over the reviews and researching that this particular revolver that it was comparable if not better overall. The price was definitely a decision maker as well. Shot my friends today and loved it. After viewing many of the reviews for this revolver I felt like this model suited my needs best. Can’t wait to fire this gun. Can you use this gun as a concealed carry? BEST ANSWER: The Ruger GP100 is a great firearm, but is not well suited to concealed carry. If you want a .357 magnum revolver for concealed carry consider the Kimber K6s or the Ruger SP101. The GP100 is a fairly large handgun. At 40 ounces you will notice the weight. There are two practical places to holster it . . . under your arm in a shoulder holster on on your hip in an outside the waistband holster. Either way you need a coat large enough to conceal it. The sights and hammer spur are large enough to become caught in clothing. The Ruger SP101 is smaller and weighs about a pound less. Its sights are less prominent. Most models have a hammer spur. The Double Action Only model does not. The SP101 holds only five rounds. Both Rugers have a very heavy (14 pound or more) trigger pull. The Kimber K6s seems to have been designed for concealed carry. It is a six round .357 magnum revolver that weighs 25 ounces. It is a Double Action Only gun so there is no hammer spur. The rear sight blends in with the frame. Its front sight is smaller than the GP100. Kimber has "rounded off" just about all of the corners of this gun so there is not much to become tangled in clothing. The K6s comes from the factory with a comfortable 10 pound trigger pull. Both the Kimber K6s and Ruger SP101 are available with 2" barrels and 3" barrels. With these lighter guns you will feel more recoil than with a heavier revolver. They also have fairly small grips, which can take some practice before they feel comfortable. Both of them are small enough to holster practically anywhere on your body, and even to carry in an ample pocket of your jacket. The Kimber K6s has the highest price of these revolvers, the GP100 is in the middle and the SP101 is the lowest priced. To sum up, the Ruger GP100 may be the best choice for open carry but not concealed carry. The Kimber K6s, if it fits your budget, may be the best .357 magnum revolver for concealed carry. Enjoy your choice and stay safe. The 4.2" barrel version of this gun is not able to be conceal carried. It is just too big. This gun is better suited to be carried outside the waist band, but obviously that's not concealed. It's excellent for home defense and it does fit in most car locations such as a glove compartment. However, the gun is too long for the smaller lock boxes used in vehicles. I considered a 3" barrel originally, but purchased the 4.2" barrel gun. I REALLY like it for home defense. 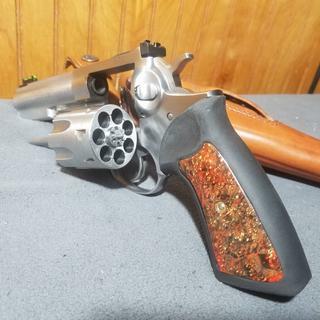 It has nice weight, a quality feel to it, and the fact that it's a revolver means that it'll go bang when you pull the trigger, regardless of how long it sits being loaded. I believe that the 3" barrel version of this gun would be difficult to conceal carry, also because of the overall length and width (the handle) of the gun. Yes! I carry a veriety of guns, from .357 - .50AE, DEPENDING ON MY CHOICE OF CLOTHES. RUGER'S GP100 is very comfortable, and the 7 rounds is just a plus. And at the times I feel the need for more power, I carry my Ruger .454 Alaskan. I'm a big power and Ruger fan! It is really too big for a conceal carry gun. 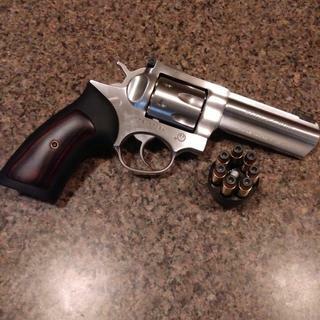 This is a good sized gun which handles the 357 caliber very nicely. The size of the gun makes it comfortable to shoot, but it is not for concealed carry. To be honest, yes. I purchased a Gould and Goodrich pancake left hand holster for mine. I am by no means a slim build and this gun rides and conceals comfortably against my body even under a tee shirt. I’m 6 ft tall 185 and slim build. It would be a bit bulky for me to carry unless under loose clothes. I love the gun and carry it all the time when I’m in the woods. It would be possible but I would not recommend it as a carry gun. It is a rather hefty firearm, but very handy. Check out Ruger SP101 for a carry option. It’s a big frame, solid gun. I would recommend the 3 inch version for concealed carry. Great shootings guns either way. I have it and love the gun. It’s too large in my opinion to carry concealed unless you plan to carry in winter. i think it’s too big to conceal, but sure is an amazing pistol and will have it for the rest of my life. With the right body type and holster (and clothing), you can use any gun for concealed carry. You could, but it’s weight and size dimensions would be potential downsides. Sure. All depends on your clothing and where you carry your gun. Great product. Was delivered quickly. Everything was timely and the product was as advertizes. I love this revolver. very nice super smooth operation. very accurate with the front fiber optic sight. no recoil even with magnum loads. grab-a-gun was superb - great experience. I love this gun & it was delivered quickly & safely at a great price. I'm not sure why & I cannot point fingers...but this was THE dirtiest NEW gun I have ever gotten! Seems to be a solid and accurate gun. A few things to note. There were a lot of sharp edges and burrs from machining, i think this should have been deburred and the edges knocked off by Ruger, but it only took a few minutes to take care of. second the the chamber spacing on the cylinder is so close that on some brands of ammo the case heads will interfere with each other and will not allow the cylinder to close. Most of the time you can press them in to be able to shoot but that leads to very difficult extraction. Third the double action pull out of the box leaves something to be desired. It is very heavy and kinda clunky. It does have a great single action trigger pull with no take up and a perfect crisp break. overall I am pleased with the revolver and would buy it again. Grabagun delivered to my FFL in 3 or 4 days.... living in IL had to wait another 3 days after background check to pickup. Price was great even after paying for transfer. I LOVE this revolver....single action is fine.... double action decent. Sights right on out of the box....shot both American eagle brass and cheap steel first time out with no issues. Recoil is very manageable...not an issue at all. Having the extra round is nice, and fiber optic sight and the nicer wood inlay grip really sets this gun off. This will definitely be be handed down to my daughter...she likes shooting too!!!! Great gun unbeatable price. I wished I would of used GrabaGun sooner. Would of saved a lot of money for more guns. Ordered it a few weeks ago! Shipping was fast and transaction was smooth. When I held it in my hand, I can feel the quality. Haven’t had a chance to try it since it was too cold in MN. Great shooting revolver. Built like a tank. You can't go wrong if you purchase this revolver. No issues with this gun at all. Great Transaction all the way around. GrabAGun added my FFL no problem shipped out promptly to California will buy from again. Fits my hand comfortably. Fist time out I shot Fiocchi 142 GR truncated .357 Magnum. The GP100 spit them out like paper balls through a straw. And it looks nice sitting to my Beretta 92 in the safe. Easy processing. Good communication. Fast delivery to my FFL. Great buying experience. Great gun! 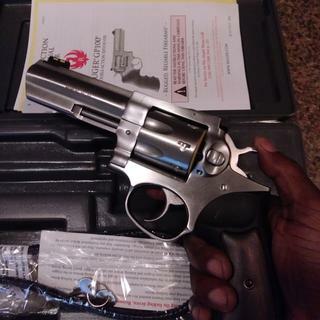 FAST SHIPPING...HIGHLY RECOMMEND GRAB A GUN...THE RUGER GP100 IS THE BEST REVOLVER ON THE MARKET IMO....AND AT A GREAT PRICE FROM GRAB A GUN. Love this gun. Very dependable and easy to shoot. My wife is very petite and of all my handguns this is her favorite and most comfortable to shoot. 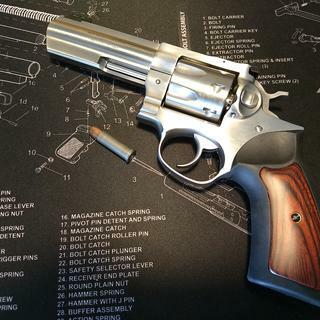 Great 357 revolver. I really like the fiber optic front sight, and the balance is better than the 6 inch version. It's a bonus being able to use 38 special for cost and new shooters. This GP shoots better than I can. Transaction with GrabAGun was excellent. I had bought a SP101 earlier this year and I thought it was great, the two extra shots with the GP100 are an added plus. This is my new favorite weapon. Thanks to GrabAGun & Ruger I really like this weapon, great price, great shipping. IT'S a Beast. Great gun! And couldn't have had a better experience with Grab a gun! Love this gun. Easy to disassemble and tune up the action. It's a tank. Excellent Ruger at a great price! I bought this gun YEARS ago an it has been my absolute favorite wheel gun in my collection! Right out of the box it shot like a dream no matter what ammo I put in it, & believe me, over the years I have shot SEVERAL different kinds of ammo through it! Trigger pull wasn't bad at all but I wanted it really really light so added a spring kit to it & just mad a great weapon even better! Hell, after my wife shot she wanted one for herself. I would recommend this pistol to anyone. I carried it for a few years in a shoulder holster until I switched to a semi-auto. I never had one single problem with it an as far as the price goes, I paid what Grab A Gun is asking years ago so I think it's a great price for such a quality weapon.